We are happy to offer all phases of Preventive , Restorative and Cosmetic dentistry ranging from regular check ups and cleaning to in depth restorative care to beautifully transformative cosmetic services . The doctor will review all findings and discuss possible treatment options to help you achieve the smile that you want and deserve. Establishing a relationship and returning for scheduled dental appointments will ensure a lifetime of smiles for you and your family. Sealants are a plastic resin material that is applied to the chewing surfaces of the back teeth—premolars and molars. They act as a barrier, protecting enamel from plaque and acids that contribute to dental decay. Toothbrush bristles cannot reach into the deep depressions and grooves of teeth and the sealant helps to protect these areas. Sealants are easily applied and take only a few minutes for each tooth. Sealants will be checked at each appointment to make sure they are retained, and will generally last several years before reapplication is needed. In the office: Treatment can be done during your regular exam using a tray and gel or foam fluoride, or fluoride varnish which is more highly concentrated and brushed onto the teeth. All children and adults who participate in contact sports should wear a mouthguard to protect their teeth against blows to the face or mouth. A properly fitted mouthguard can help prevent broken teeth and injuries to the lips, tongue, face or jaw. While there are many types of mouthguards, the best is a custom-made mouthguard, designed specifically for your teeth. Ask your dentist about custom options to protect your smile. Proper growth and development is an important aspect of total body health. If a child loses a baby tooth early through decay or injury, other teeth could shift and cause crowding or filling of the vacant space. This can prevent permanent teeth from growing properly or cause problems with chewing and speaking. To prevent this, space maintainers are placed to hold the spot left by the missing tooth. This could be a band or temporary crown attached to one of the adjacent teeth. Later, as the permanent tooth grows into the spot, the space maintainer is removed. In-Office Whitening : If you are a candidate for whitening, your dentist may suggest a procedure that can be done in his or her office. This procedure is called chair side or in-office whitening, and may be completed in as little as one visit. During an in-office whitening procedure, the dentist will apply either a protective gel to your gums or a rubber shield to protect the oral soft tissues. A whitening agent is then applied to your teeth, and a special light may be used to enhance the action of the agent. Custom Whitening Trays : Custom take-home whitening products typically come in a gel which is dispensed into a tray or mouthguard. These trays can be made by your dentist to fit your teeth precisely. Usage may vary depending on the product. Some products are used twice a day for approximately 2 weeks, and others are intended for overnight use for 1-2 weeks. Over the Counter Whitening : It’s a simple and fast way to start a whitening treatment or for whitening touch-ups and available over the counter. We recommend that you consult with your dentist to determine which option is best for you. Your dentist may need to perform an exam to determine if your teeth are healthy enough for whitening. Veneers are ultra-thin shells of ceramic (porcelain) or a composite resin material, which are bonded to the front of teeth. This procedure requires little or no anesthesia and may be the ideal choice for improving the appearance of the front teeth. Composite resin veneers can generally be done in a single appointment. After a small amount of preparation, the dentist will bond and sculpt composite filling material onto the teeth. Porcelain veneers are created in a dental laboratory from a mold that is taken after the teeth have been prepared. A second appointment is required for placement of the porcelain veneers. are a brand of porcelain veneers that require little to no removal of tooth structure. They require 2-3 dental visits and are a great solution for stained, chipped, discolored, or misaligned teeth. A crown, sometimes referred to as a cap, covers a tooth to restore it to its normal shape and size, strengthening and improving its appearance. A crown may be recommended to cover and support a tooth with a large filling. It can be used to attach a bridge, protect a weak tooth from breaking, or restore one that is already broken. Our practice focuses on diagnosis and prevention of gum disease at its earliest point. You will be screened for signs and symptoms of gum disease during visits to our office. Once diagnosed, treatment for gum disease can include non-surgical treatment in-office for earlier stages, and/or referral to a specialist when necessary. The depth of the gum tissue between the teeth and gums are called pockets. The American Academy of Periodontology recommends that every adult receive a periodontal evaluation each year to determine whether deep cleaning or additional treatment is needed. Measuring pocket depth is just one part of a comprehensive dental evaluation. Ideally, normal healthy pockets will be no more than 3 millimeters deep. If the pockets are greater than 5 millimeters, your dentist might prescribe a deep cleaning or scaling and root planning for you. Deep cleaning is also known in the dental world as scaling and root planning. Scaling involves removing plaque and tartar from the surface of the teeth and from the pocket area between the teeth and gums using either ultrasonic instruments or manual scaling tools. The other part of deep cleaning is root planning. The dental hygienist will use a scaling instrument to remove plaque and tartar from the surface of the roots of your teeth. A follow-up visit may be necessary to confirm that your gums and teeth are getting healthier. Ideally, after this deep cleaning appointment, the bacteria in the pockets of the teeth will be removed and in the next few weeks the gums should become healthier if the person is doing oral hygiene every day. Antibiotic therapy, such as Arestin, can also be used to treat this disease and may be recommended as part of your overall care plan. Follow-up care, usually every 3 months, is necessary to reduce risk for progression of disease. If left untreated, periodontal disease, better known as gum disease, can increase risk for other conditions including pre-term delivery with pregnancy, respiratory disease, diabetes and heart disease. To treat a cavity, your dentist will remove the decayed portion of the tooth and then “fill” the area on the tooth where the decay was. Fillings are also used to repair cracked or broken teeth and teeth that have been worn down from misuse (such as from nail-biting or tooth grinding). Teeth can be filled with gold, porcelain, silver amalgam, or glass materials called composite resin fillings. 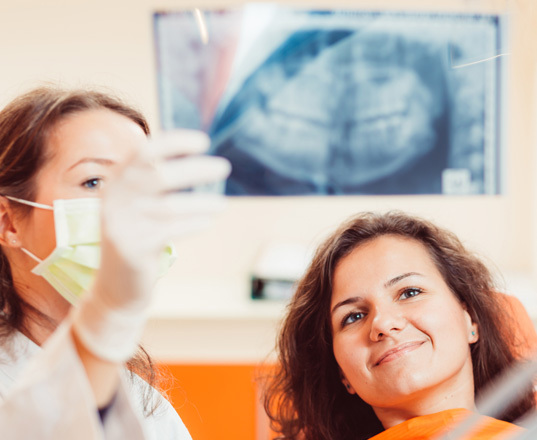 The location and extent of the decay, cost of filling material, insurance coverage, and your dentist’s recommendation help determine the type of filling that will best address your needs. To maintain your fillings, you should follow good oral hygiene practices – visit your dentist regularly for cleanings, brush with a toothpaste containing fluoride, and floss at least once daily. If your dentist suspects that a filling might be cracked, he or she will take x-rays to assess the situation. If your tooth is extremely sensitive, if you feel a sharp edge, if you notice a crack in the filling, or if a piece of the filling is missing, call our dentist for an appointment. When considering tooth fillings, one of the options available is composite fillings which are made from durable plastics that are similar in color to natural teeth. Because the composite fillings are tooth-colored, they look more natural and are less noticeable compared to other types of fillings.There are other advantages to composite, tooth-colored fillings such as, most importantly, its ability to bond to tooth structures. Also, in many cases these fillings can be repaired by the addition of more composite material. Speak with our doctor to find out which kind of filling is best for you. A bridge is a dental appliance that replaces one or more natural missing teeth, thereby “bridging” the space between two teeth. Fixed bridges are cemented onto the teeth on either side of the space. Unlike removable partial dentures, fixed bridges cannot be taken out of the mouth by the patient. If you are missing any teeth and are committed to maintaining good oral hygiene practices, you may be a good candidate for a bridge. If left unfilled, this space can cause the surrounding teeth to drift out of position and can cause teeth and gums to become more susceptible to tooth decay and gum disease that can cause further tooth loss. Fixed bridges not only correct an altered bite, improve your chewing ability and speech, but they also safeguard your appearance by preventing the collapse of your facial features that can cause premature wrinkles and age lines. With a bridge, it is more important than ever to brush, floss, and see your dentist regularly. If you do not control the buildup of food debris and plaque–the sticky film of bacteria formed from food acids–your teeth and gums can become infected, requiring further treatment and resulting in possible loss of the bridge. Your dentist may also recommend using floss threaders that help remove bacteria from hard to reach spaces between the bridge and adjacent teeth and gums. If you maintain optimal oral hygiene care, you can expect your fixed bridge to last as many as 8-10 years, or even longer. A root canal is a treatment used to save a tooth that is badly decayed and/or becomes infected. Nerve and pulp, the soft area within the center of the tooth, can become irritated, inflamed, and infected due to deep decay, repeated dental procedures on a tooth, large fillings, a crack or chip in the tooth, or trauma to the face. During a root canal procedure, the nerve and pulp is removed and the inside of the tooth is cleaned and sealed. What Should I Expect After the Root Canal? The root canal procedure should relieve the pain you feel. Until your root canal procedure is completely finished – that is to say, the permanent filling is in place and/or the crown is placed, it is wise to minimize chewing on the tooth under repair. This step will help avoid re contamination of the interior of the tooth and also may prevent a fragile tooth from breaking before the tooth can be fully restored. For the first few days following the completion of treatment, the tooth may feel sensitive due to natural tissue inflammation, especially if there was pain or infection before the procedure. A denture is a removable replacement for missing teeth and adjacent tissues. Complete dentures replace all the teeth, while a partial denture fills in the spaces created by missing teeth and prevents other teeth from changing position, similar to a bridge. Complete dentures are either “conventional” or “immediate.” A conventional denture is placed in the mouth about a month after all the teeth are removed to allow for proper healing, whereas an immediate denture is placed as soon as the teeth are removed. Even if you wear full dentures, you still must take good care of your mouth. Brush your gums, tongue, and palate every morning with a soft-bristled brush before you insert your dentures to stimulate circulation in your tissues and help remove plaque. A denture is fragile, so it is important to handle it with care. Remove and brush the denture daily, using products designed specifically for cleaning dentures. Don’t sterilize your denture with boiling water because it will cause it to warp. If you wear a partial denture, be sure to remove it before brushing your natural teeth. When not in use, soak it in a cleanser solution or in water. Get in the habit of keeping the denture in the same safe and handy place to reduce the likelihood of misplacement. It is important to continue having regular dental checkups so that a dentist can examine oral tissues for signs of disease or cancer. As you age, your mouth will continue to change as the bone under your denture shrinks or recedes. To maintain a proper fit over time, it may be necessary to adjust your denture or possibly remake your denture. Never attempt to adjust a denture yourself. When in doubt, consult your dentist. Sometimes called TMJ, Temporomandibular disorders (TMD) occur as a result of problems with the jaw, jaw joint and surrounding facial muscles that control chewing and moving the jaw. TMD can cause pain or poor function in the jaw joint and surrounding muscles. There are several potential causes of TMD. A majority of the disorders stem from muscle problems. A small portion of the disorders come from problems within the joint itself. Treatments can include simple home remedies, use of a bite splint, drug therapy, physical therapy or surgery. If you think you might be suffering from TMD, your dentist can help you determine the best course of action. No one looks forward to tooth extractions, but sometimes they are necessary. Although there is some discomfort that accompanies tooth removal, it is nothing compared to the problem that is causing the pain and discomfort in the first place. The oral health benefits make it worth resolving the problem, especially if you are in pain or have an infection. The number one cause of tooth loss is periodontal disease, therefore, despite numerous modern advances, tooth extractions are sometimes still needed. Tooth extractions are one of the most common procedures performed and, outside of periodontal disease, there are a variety of reasons a dentist may opt for an extraction over another type of treatment. For example, children may need more room in their mouths as their adult teeth come in or when they are about to get braces. As a result, one or more teeth may be removed. Teeth are sometimes extracted when a person is fit for dentures. In general, though, when a tooth is removed it is usually due to serious decay that cannot be corrected otherwise. When the nerves have become infected or teeth are loosened by gum disease, extraction may be necessary not only to improve dental health, but to prevent a serious health issue. It is important to remember that oral health is essential for one’s well-being. Having unhealthy teeth can lead to heart problems, persistent inflammation, and other concerns. Poor oral health is also associated with chronic health conditions such as diabetes, osteoporosis, and respiratory disease, among others. Memory can also be affected by poor oral conditions. Healthy teeth and gums allow a person to enjoy adequate nourishment, so nutritional deficiencies are reduced. Making enough room for other teeth to grow is necessary for dental health as well. Removal of all teeth is vital when dentures are going to become a new addition, and can truly improve a person’s quality of life when there is no more pain associated with decayed or damaged teeth. Not everyone is born with perfect teeth and many adults would love to straighten their teeth subtly and inconspicuously, but may think that traditional metal braces are the only option. Invisalign, the “invisible” teeth straighteners, are constructed differently than their metal counterparts, but are just as effective in most cases. For example, instead of metal brackets, Invisalign braces are made of a clear plastic material, but function in the same way by applying pressure gradually over time to straighten and correct crooked and gapped teeth. The biggest difference is that Invisalign clear braces are just that – clear – so they are nearly undetectable by others. This is especially appealing to adults who don’t want to flash a mouth full of metal at that important business meeting or social engagement. Many of the patients choose this option because of the way the braces look. It’s a great choice for people concerned with their appearance while wearing braces, as this treatment can be lengthy in some cases. Teenagers and adults often prefer this type of orthodontic correction due to its “invisibility.” Invisalign braces are also just as affordable as traditional metal braces, so improving your smile and appearance is as accessible as ever. Invisalign clear braces can completely reshape your smile and improve your oral health dramatically. Ask us about our financing plans and insurance options, and make your dream of a beautiful smile a reality. Bone grafting is a procedure that is done to preserve or build up the jaw bone, often in conjunction with dental implant treatments. Bone grafting can range from very simple to very complex. The simplest form of bone grafting is known as socket preservation. Socket preservation is done when a tooth is extracted. When the tooth is removed, bone graft material is placed into the socket where the tooth was, a membrane is placed over the graft to hold the material in place, and the area is stitched closed. Generally this area is allowed to heal for 3-4 months, and then a dental implant may be placed into the new bone. The purpose of socket preservation is to prevent the bone from collapsing as it is healing from the tooth extraction. If no bone graft is placed after a tooth is extracted, it may heal in a way that makes implant placement more difficult or not possible. For patients that have been missing teeth for several years or more, the bone in the area where the teeth used to be may have shrunk considerably. In these cases, it may be necessary to do bone grafting to build up the amount of bone to allow implants to be placed. This type of bone grafting is more involved than the socket preservation described above. Bone grafting is a wonderful technique that allows dental implants to be placed where they otherwise could not. Removable partial dentures usually consist of replacement teeth attached to pink or gum-colored plastic bases. Depending on your needs, your dentist will design a partial denture for you. A partial denture may have a metal framework and clasps that connect to your teeth, or they can have other connectors that are more natural looking. In some cases, a removable partial denture is made to attach to your natural teeth with devices called precision attachments. Precision attachments are generally more esthetic than clasps. Crowns on your natural teeth are sometimes needed to improve the fit of a removable partial denture and they are usually required with attachments. Partial dentures with precision attachments generally cost more than those with clasps. Consult with your dentist to find out which type is right for you. In the beginning, your new partial denture may feel awkward or bulky. This is normal, and you will eventually become accustomed to wearing it. Inserting and removing the partial denture will require some practice. Follow all instructions given by your dentist. Your denture should fit into place with relative ease. Never force the partial denture into position by biting down. This could bend or break the clasps. Your dentist will give you specific instruction about how long the denture should be worn and when it should be removed. Initially, you may be asked to wear your partial denture all the time. Although this may be uncomfortable at first, it’s the quickest way to identify areas that may need adjustment. If the denture puts too much pressure on a particular area, that spot will become sore. Your dentist will adjust the partial denture to fit more comfortably. After making adjustments, your dentist will probably recommend that you take the partial denture out of your mouth before going to bed and replace it in the morning. Eating should become a more pleasant experience with dentures. Start out by eating soft foods that are cut into small pieces. Chew on both sides of the mouth to keep even pressure on both sides. Avoid foods that are extremely sticky or hard. You may want to avoid chewing gum during the adjustment period. Partial denture can also help improve your speech. If you find it difficult to pronounce certain words, practice reading out loud. Repeat the words that give you trouble. With time, you will become accustomed to speaking properly with your partial denture. The newer flexible removable partial dentures (RPDs) are being used more and more commonly for temporary, or on occasion permanent, replacement of missing teeth. These dentures are providing a comfortable and successful alternative to traditional RPDs. The flexibility of these dentures provides several advantages over the traditional RPD alternatives made of rigid, acrylic plastic resin. Instead of metal clasps, they have thin finger-like extensions that fit or snap into natural concavities in the crowns of the teeth near the gum line. The realistic-looking, gum-colored base can be made to cover areas where natural gum tissue has receded (shrunk down) and partially exposed tooth roots so that flexible RPDs provide a smile improvement and offer an instant aesthetic solution. Involves one or more combination of dental procedures to satisfy the patients aesthetic concerns.